Risk mitigation is essential to surviving in today's online society. Many purported borrowers participate in all or nothing cash grabs and swindle their loaners, discrediting loyal borrowers and rewarding fake products/companies. Data is then collected on the new credit score, credit history, infrastructural conditions, and borrower's business plan to help in analysis of overall global trends, and allows the investor to keep track of how his money is being put to good use. The app was built using Android Studio, and the web app was built with React. 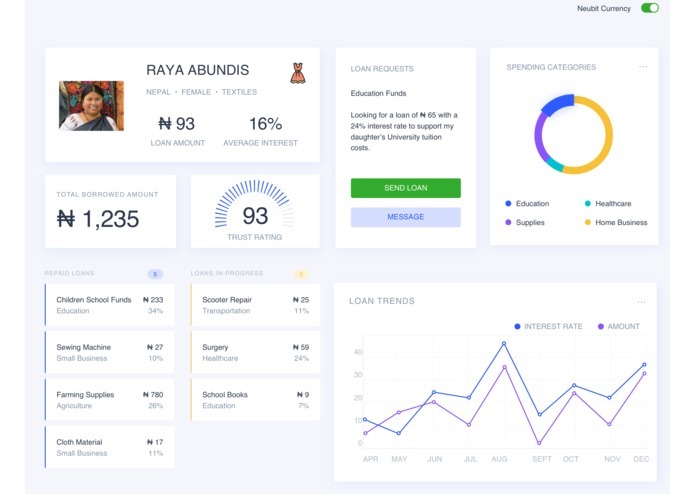 Initially, the plan was to create a mobile to mobile platform that could communicate between the investor and borrower. However, the microstrategy API was more optimized towards web apps. We're proud of the functionality of the mobile app. We learned how to create a full-scale Ethereum Smart Contract. Improve the mobile and web app. Developed the Smart Contract using Ethereum Solidity, the web application in ReactJS and mobile application in Android Studio. Designed the User Interface using Sketch.